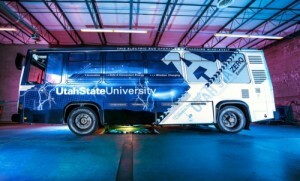 Utah State University presented a first-of-its-kind electric bus that is charged through a high-power, high-efficiency wireless power transfer system. By carefully applying a mix of modern advances in engineering and Nikola Tesla’s principles of induction, USU engineer Hunter Wu and his team have solved one of today’s vexing problems in WPT. Read full True Activist article..
See NBC News coverage too..
Read Environmental Science Degree article..
Newsweek and The Daily Beast’s annual ranking of US and Global companies and politicians by how green, or not green, they are. World’s first Air-Powered Car Goes on Sale This Month. This engine for the $8,177 Indian-made Tata “Mini CAT” runs on compressed air for about 1.8 cents per mile or about one-tenth the cost of gas.